The United States Congress designated the South Jackson Mountains Wilderness (map) in 2000 and it now has a total of 54,536 acres. All of this wilderness is located in Nevada and is managed by the Bureau of Land Management. 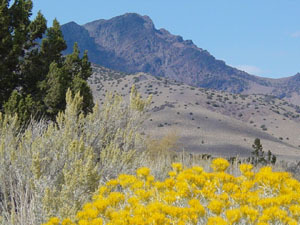 The South Jackson Mountains Wilderness is bordered by the North Jackson Mountains Wilderness to the north and the Black Rock Desert Wilderness to the west. The Wilderness contains the southern portion of the Jackson Mountains. Elevations in the Wilderness range from 3,900 to 8,923 feet on top of King Lear Peak. Sagebrush is the dominant vegetation type, with saltbrush and greasewood occurring at the lower elevations. Several canyons also contain willows, cottonwoods, aspens and other riparian species. Junipers occur in the higher elevations. The area has numerous rock outcrops and deep rugged canyons also dissect the area. Wildlife in the area includes California bighorn sheep, mule deer, pronghorn antelope, mountain lions, coyotes, and sage grouse. Planning to Visit the South Jackson Mountains Wilderness? How to follow the seven standard Leave No Trace principles differs in different parts of the country (desert vs. Rocky Mountains). Click on any of the principles listed below to learn more about how they apply in the South Jackson Mountains Wilderness.